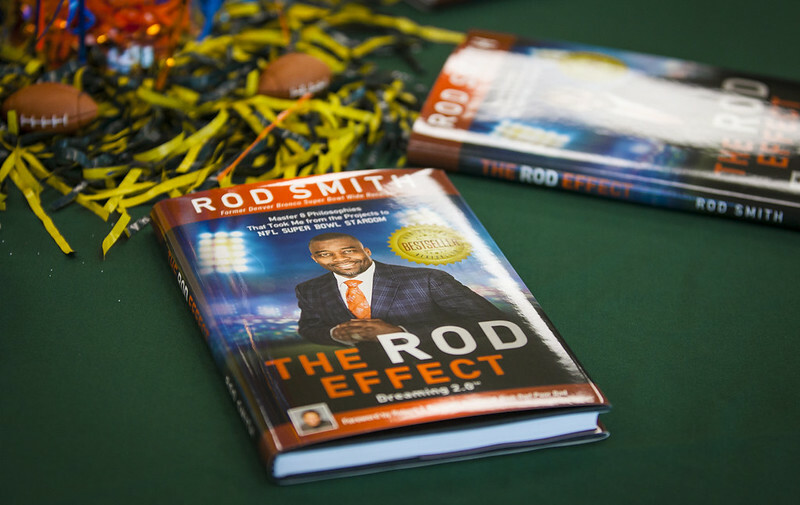 So begins the blurb on the back of “The Rod Effect” – a recent book about the principles that helped MSSU alum and football star Rod Smith along his journey from the projects to Missouri Southern, the NFL and beyond. Dozens of fans gathered on Oct. 21 to hear the former Denver Bronco wide receiver speak about his career, his book and advice to those following in his footsteps. The eight principles in his book – including Desire, Responsibility, Mentorship and Integrity – are what guided him along a path to success, he said. Smith, ’93, was a two-time, first-team All-American during his time with the Lions. In 1991, he was named the MIAA’s Offensive MVP. A two-time Pro Bowl selection, he holds or shares 11 records at Missouri Southern and left the university as that year’s Outstanding Graduate. He joined the Denver Broncos as a rookie free agent in 1994. He is the team’s all-time leader in receiving yards and ranks second on their list for career receptions, and collected two Super Bowl championship rings along the way. In 2012, he was inducted into the Broncos’ Ring of Fame following his retirement. Those connections include the long friendships he had with his former coach at Missouri Southern, the late John Lantz, and Robert Corn, former head coach of the Lions basketball team. They’ve helped him maintain a long-lasting relationship with his alma mater. To those following in his footsteps, he offered two key words of advice: Enjoy it. “When you’re a young man playing football in high school or Pop Warner, it’s fun,” said Smith. “In college, you start thinking about the next level, but don’t enjoy this level. Following his presentation, the Athletics Hall of Fame: Rod Smith Digital Gallery in the lobby of the North End Zone Facility was dedicated in his honor.